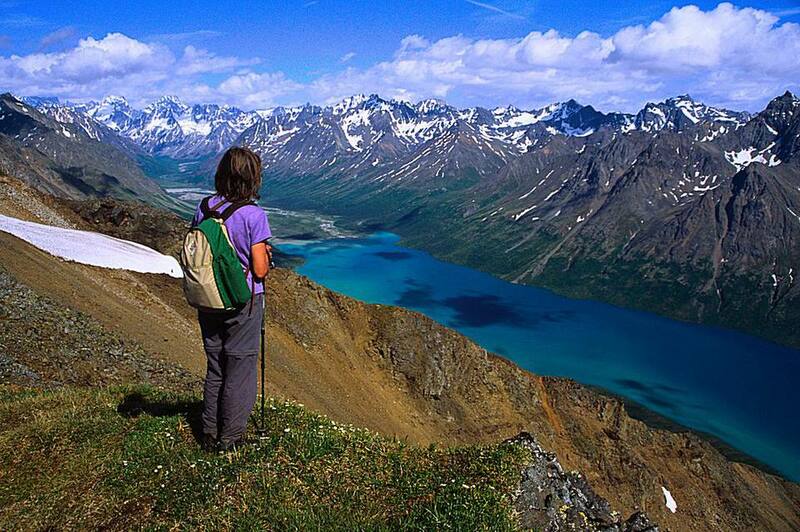 Lake Clark is one of Alaska’s most diverse and stunning parks to visit. It is hard to be in awe of crystal clear lakes reflecting massive glaciers and volcanoes. Now throw in herds of caribou, roving bears, and countless seabirds. Not enough beauty? Imagine dense forests and miles of tundra stretching into the sunset. All of that, and more, is concentrated in one percent of the state of Alaska - in Lake Clark National Park & Preserve. Lake Clark was established as a national monument in December 1978. In December 1980 the Alaska National Interest Land Conservation Act (ANILCA) was passed by Congress and signed by >a href="http://americanhistory.about.com/od/jimmycarter/a/ff_j_carter.htm">President Carter. The legislation set aside more than 50 million acres of land as National Parks and Preserves, changing Lake Clark from a national monument to a national park and preserve. Today, over 104 million acres are protected as National Parks and Preserves, National Wildlife Refuges, National Forests, Bureau of Land Management, and National Monuments. The park is open year-round, though most people visit between June and September. Plan your visit for summer. During late June, wildflowers are in full bloom and and amazing sight. For fall foliage, plan a trip during August or late September. From June through August, temperatures stay in the 50’s and 60’s in the eastern part of the park, and are a little higher in the western part. Most visitors choose to fly into the interior part of the park, as Lake Clark National Park and Preserve is not on the road system. When weather and tides permit, the east side of the park on the Cook Inlet coast may be accessed by boat from the Kenai Peninsula. Visitors must take a small aircraft or air taxi to the park. Float planes may land on lakes throughout the area while wheeled planes can land on open beaches, gravel bars, or private airstrips in or near the park. A one to two-hour flight from Anchorage, Kenai, or Homer will provide access to most points within the park. Scheduled commercial flights between Anchorage and Iliamna, 30 miles outside the boundary, are another option. A list of air taxi providers on the official NPS site. There are no fees or permits necessary to visit the park. Outdoor activities include camping, hiking, birdwatching, fishing, hunting, kayaking, canoeing, rafting, and wildlife viewing. Basically this is an outdoor enthusiasts dream. The park has no trail system, so planning and route selection are critical. Be prepared with wind and rain gear, insect repellent, and first aid. If you plan on hiking without a guide, be sure to bring a detailed map and try to stay on long, dry tundra when possible. If you get tired of being on your feet, head to the water for another exciting way to explore the park. Kayaking is a premiere way to explore as visitors can explore large areas and carry lots of gear. Good lakes for paddling include Telaquana, Turquoise, Twin, Lake Clark, Lontrashibuna, and Tazimina. And if you love to fish, get excited. Rainbow trout, arctic grayling, northern pike,and five different kinds of salmon all flourish in the park. The park occasionally offers lectures and special programs at the Port Alsworth Visitor Center, the Islands and Ocean Visitor Center, and the Pratt Museum. Contact the Port Alworth Visitor Center at (907) 781-2106 or the Homer Field Office at (907) 235-7903 for more information. Tanalian Falls Trail: The only developed trail in the park. This easy hike will take you through a forest of black spruce and birch, past ponds, along the Tanalian River, to Kontrashibuna Lake and onto the falls. Chigmit Mountains: Considered the spine of the park. These rugged mountains lie on the edge of the North America plate and contain two volcanoes - Iliamna and Redoubt - both of which are still active. Tanalian Mountain: This strenuous 3,600-foot climb pays off with stunning views of the park. For an easier hike, start at the shore of Lake Clark and head up the ridge for a round trip of about 7 miles. There are no campgrounds within the park so backcountry camping is your only option. And what a beautiful option it is! You will have no trouble finding a spot to camp out under the stars. No permit is required, but campers are encouraged to contact the field station before setting out - (907) 781-2218. Within the park, visitors may choose to stay in Alaska’s Wilderness Lodge. There are 7 cabins to choose from and are open from mid-June to October. Call (907) 781-2223 for more information. Outside the park, check out Newhalen Lodge, located on Six Mile Lake. Call (907) 522-3355 for more rates and availability. Nearby national parks include Katmai National Park & Preserve, Alagnak Wild River, and Aniakchak National Monument and Preserve. Also nearby is the Becharof National Wildlife Refuge and the McNeil River State Game Sanctuary. To the northwest, visitors may enjoy Wood-Tikchik State Park for an afternoon of rafting, kayaking, and wildlife viewing.